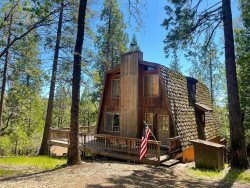 Baio Cabin - Enjoy the LOVELY sunsets on the peaceful and private back deck. Come visit us at Twain Harte Rentals. We want to make sure that you are as comfortable as possible during your stay.